At the Chicago reservoir, nine Tornado aerators are tethered to rise and fall with incoming runoff. The Chicago area’s wastewater authority wanted to add an aeration system to its three storm and wastewater reservoirs to avoid stagnant water. Reservoirs often held wastewater for a significant amount of time before it could be processed by the treatment facility. This case study explains how Fluence collaborated with the Army Corps of Engineers to design and build an effective aeration system to reduce noxious odors in the reservoirs. A combined sewer network that carried both raw sewage and stormwater served Chicago’s large residential and commercial population. Heavy urban ground cover prevents absorption of precipitation, so at one time, when heavy storm runoff exceeded the wastewater treatment plant’s capacity, raw sewage flowed into local rivers and other bodies of water. Starting in 1972, the city of Chicago began to implement improvements to its water system to bring it up to federal and state water quality standards. During heavy precipitation, the city’s three wastewater reservoirs relieve pressure from the wastewater treatment plant and a tunnel system by storing the water until it can be processed for treatment. Because untreated water can quickly become anaerobic when stagnant for too long, noxious odors would develop in the reservoirs. 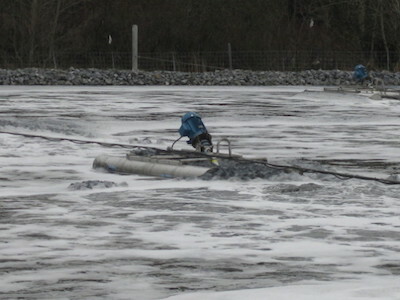 After considering several technologies that could provide aeration in the reservoirs at varying water levels, the Corps chose Fluence’s TORNADO® surface aerators to provide necessary oxygenation. Nine aerators were installed in the three city reservoirs, using the same setup for all. To provide aeration at any water level, each aerator is mounted on floating pontoons injected with water-resistant, closed-cell polyurethane foam. As the water level rises, the aerators float on the surface. The aerators are connected to steel arms and guy wires so they maintain their position in the reservoir as they rise and fall. The Tornado aerators are mounted at an angle, with their motor and air intake above the surface, and their proprietary stainless-steel propellers submerged. Water moves at a high velocity through and near the propeller, creating a low-pressure zone at the hub. The low-pressure draws air in through a stationary intake and down a large-diameter draft tube. The air exits into the water at the propeller hub. The propeller creates turbulence and flow that can break up air bubbles, mix the basin, and disperse oxygen. During dry periods, the aerators rest on the reservoir floor, with their motors turned off. Once the water level reaches 7 feet, the aerators automatically turn on. As the water level increases, additional aerators are activated to provide adequate amounts of oxygen to the wastewater. Aerators are also accessible for manual operation through a control panel. When the reservoirs near capacity, all nine aerators are engaged, slowly circulating the wastewater in a counterclockwise direction. Rotation and full subsurface aeration prevent the wastewater from becoming septic and eliminate noxious odors. The use of Tornado surface aerators has kept the reservoirs properly aerated. They save energy by operating only as needed. In addition, every aerator is equipped with a premium-efficiency motor (PEM) to further reduce energy costs. These larger motors are designed to work with soft-start or variable frequency drive (VFD) controllers to reduce energy use and eliminate power-surge penalties. Contact Fluence to learn more about how you can use surface aerators to increase oxygenation of wastewater reservoirs, or to discuss your next project with our experts.